This story was updated at 7:26 p.m. EST. California safety inspectors have cited the private spaceflightcompany Scaled Composites in connection with an explosion that killed three ofthe firm?s workers last July. The citations, issued Thursday, faulted theMojave, Calif.-based firm for failing to provide ?effectiveinformation and training of the health and physical hazards associated withnitrous oxide,? a compound used during a July 26 test that ended in an explosion, killingthree employees and injured three others at the Mojave Air and Space Port. ?Scaled Composites regretsthat this accident occurred, and we have expressedour condolences to the victims and their families and provided support duringthis difficult time,? said Doug Shane, Scaled Composites executive vicepresident, adding that the firm cooperated fully with California?s Division ofOccupational Safety and Health Administration (Cal/OSHA) during the investigation. ?And we continue to work withthe agency so that the enhanced procedures already implemented promote thesafest workplace conditions possible,? Shane told SPACE.com. Led by aerospace visionaryBurt Rutan, Scaled built and flew the piloted, air-launched SpaceShipOne suborbitalspacecraft three times in 2004, two of which launched within two weeks to win the$10 million Ansari X Prize. The firm was conductingtests as part of the developmentfor SpaceShipTwo, a larger spaceliner designed to carry space tourists tosuborbital space for VirginGalactic, when the deadly accident occurred last summer. According toFriday?s report, Scaled faces up to $25,870 in fines for the citations. ?The company has 15 workingdays from date of issuance to pay the assessed fines or appeal them,? KateMcGuire, a spokesperson with Cal/OSHA, told SPACE.com in a statement. Like SpaceShipOne, the newSpaceShipTwo will be air-launched by a carrier craft. 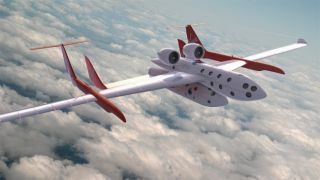 But the new craft is expected to carryup to eight people - two pilots and six passengers - at a time to an altitudeof 68 miles (110 kilometers), where they would experience several minutes ofweightlessness before returning to Earth. Scaled and Virgin Galactic officialswere working toward a planned rollout of SpaceShipTwo later this year andoperational flights in 2009 when the accident occurred. Virgin Galactic plans tostage its space tourist flights out of a centralterminal at Spaceport America in New Mexico. Editor's note: This story was corrected to reflect the fine amount. The citations included $25,870 in fines, not $25,310 as initially reported.